Lurline's Place: Dolly Quilt Swap 6! Well, I could do it again - change my mind! I'm not sure my Recipient is quite this girlie? 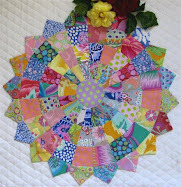 Never mind - I'll puddle along with this idea for the time being - it will definitely be a little wall hanging for someone! As you can see, I have just let the fabric do the talking - I'll big-stitch hand quilt it with Perle thread and maybe then a winter white lacy knitted edge! 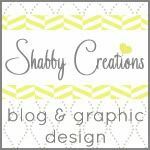 Check out my Sidebar and if the fancy takes you and visit Kelani Fabrics - I'm really quite chuffed to have stumbled across this shop - lots of cute fabrics! Hope you are getting lots of sewing done this weekend - oh, Easter next weekend - that will keep us off the streets (that's an expression that means 'at home and not out shopping') - though we have the internet now, don't we! That is very cute Lurline, I am sure that it will be loved by the recipient. It is so sweet Lurline. It must be liked. it is so sweet! i am still patiently waiting to learn from you how to do a knitted edge on quilts? So very adorable. What fun fabric. Will you have family joining you for Easter day? I wish you a week of joy Lurline! Cute as a button! (where did that expression come from anyways?) Any way you say it, it is CUTE! What size are you doll quilts Lurline? CUTE! Someone is going to LOVE that little darling. Lurline your dolly quilt is adorable. It definetly will be loved. Ciao volevo farti i complimenti per ilo tuo blog. Anche io ho un ragdoll come il tuo. Il mio ha 1 anno ed è un amore!!! Your dolly quilt is adorable. Love the colors. Also, I just discovered that you were featured in a magazine. Congratulations! Don't know how I missed that blog but it didn't show up on my posts here. I'm going to see if I can find the magazine. Good job and good for you! You deserve it. It is so cute. Someone is going to be very happy!! Oh so sweet, anyone would love it!! It's gorgeous, Lurline. I'm sure she'll love it. We're all the same, aren't we? Always second guessing ourselves. You went with your first instincts and they are 99.9% of the time the right ones. I ove it to pieces. Lurline it's so gorgeous, how could she NOT like it :o)!! I'm off to Kelani for a peek, thanks for the 'heads up' :o). It's gorgeous, Lurline. I'm sure she'll love it! It's adorable! Someone is going to be SO happy!! Your piece is charming! Very fun, I'll have to check out the shop you recommended! Have a blessed Easter Lurline! The doll quilt is adorable. What a fun gift! Of course I totally adore it. The fabric is so sweet and this is going to be wonderful. How could your partner not LOVE it. 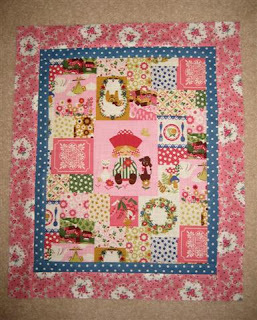 This pink doll quilt is very cute and sweet as well, but I think you made the right choice and sent the less girly quilt of the two. I do so love my new Doll Quilt, I already called two friends to come over for dinner to see it. I am trying to get them to join the swap as well and I think this will help.